Jovanka Ristic, Senior Academic Librarian and Reference Librarian at the prestigious American Geographical Society Library will discuss its map collections and other resources. Ristic has presented at local, regional, and national genealogical programs. For links to lectures and information about DNA testing for genealogy in Ireland click on the above heading. Irish Fest is August 15-18, 2019. Come and visit the Genealogy Tent on one or more days. There will be volunteers available to help you with your genealogy questions! The Irish Emigration Library will be open from 3:00 to 6:00 p.m. on the third Wednesday of each month for you to research your family history. Extra time can be extended up to 8:00 pm with a previous appointment. Call 414-395-0489 or send an email to igswis@gmail.com to arrange an extension. Meet with other members who can help you with your questions and genealogical search. Come and go as you please. The library is also available at other times of the month for genealogical research. Call the Irish Emigration Library at 414-395-0489 or email igswis@gmail.com to make an appointment. A new page has been set up to view the archive of past programs. Scroll up this page to the menu bar and click on "PROGRAMS ARCHIVE" on the right side. We are saddened to convey that Jane Maher, one of IGSW’s founders, passed away on March 28, 2016. Jane was the first president of IGSW and remained active on the board through subsequent decades, always offering welcome perspective and wisdom to the organization. Together with her husband Bill Maher and Doris and Cal Cummings, she oversaw the development of the Irish Emigration Library, and continued to direct and staff the library into the current year. After her husband’s death, she single handedly edited the IGSW Quarterly, ensuring its continuance through 25 years. Jane’s productivity and resilience were matched by her keen intelligence and truly remarkable memory. She remembered and recognized virtually every library visitor and Fest genealogy volunteer, recalling with ease their families and their stories. Always measured and careful in her decisions and her words, she embodied grace and kindness. She will be deeply missed. Funeral mass will be at 7pm Monday, April 4, at Pius X in Wauwatosa with visitation beginning at 4pm. The IGSW board welcomes suggestions from the membership for a memorial to this remarkable woman. Following its successful launch event in Dublin in 2013, Genetic Genealogy Ireland returns for a third year of DNA Lectures at the Back to Our Past event in Dublin, once again kindly sponsored by FamilyTreeDNA and organised by volunteers from ISOGG. For more information and tickets click on the headline above. From GenealogyInTime Magazine. Click on above headline. Click on the arrows at the bottom of the screen to change the slides. Presentation courtesy of Milwaukee Public Library. Written permission to publish any images in this presentation must be obtained from copyright or literary rights owner and from the library for any publication or commercial use of copies. Learn how to find your story on Ancestry.com. Sponsored by the Irish Genealogical Society of Wisconsin, the Irish Emigration Library is free and open to the public. It houses a unique collection of genealogical information not found anywhere else in Wisconsin. Books, periodicals, maps, microfilm and city directories are just a few of the resources found at the library to assist you in tracking your family history. 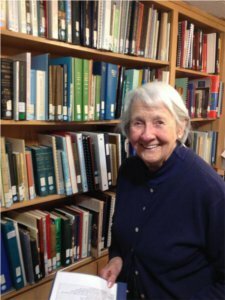 Perhaps the most important resource at the Library is Jane Maher, Director of the Irish Emigration Library and founder of the Irish Genealogical Society of Wisconsin. Founded in 1999, Jane and a small group of volunteers will help you trace your family history. Watch Edie Falco travel to Milwaukee to find her roots on "Who Do You Think You Are?" 1940 Census Records Are Online! The 1940 census records were released this morning, and the National Archives website buckled under the load. About 1.9 million users hit the archives servers in the first four hours the data went public, but many of those users got no further than a screen that said "Preparing Image." Click here to read the original article written by our founder Jane Mahar Maher. An Irish family history website has discovered records which reveal that Walt Disney's ancestors rented 33 acres of land in County Kilkenny. Dublin based website findmypast.ie has uncovered documents clearly showing the family's links to the small parish of Rathbeagh. The cartoonist has long been rumoured to have ancestry in Ireland, but the newly discovered records show, in detail, Disney's family history. to watch the Ken Burns Prohibition Documentary on PBS.